Topics: Contacts, Sir John Adams, What The Adams Institute Does, Discover, Events, and Lectures. 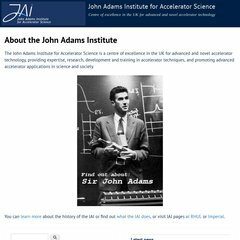 adams-institute.ac.uk Opportunities from Accelerator Technology - John Adams Institute ..
adams-institute.ac.uk News - New director for John Adams Institute - John Adams .. It is written for PHP/5.2.10-2ubuntu6.5 language. Its 2 nameservers are dns0.ox.ac.uk, and dns2.ox.ac.uk. Oxford University (England, Oxford) is the location of the Apache/2 server.